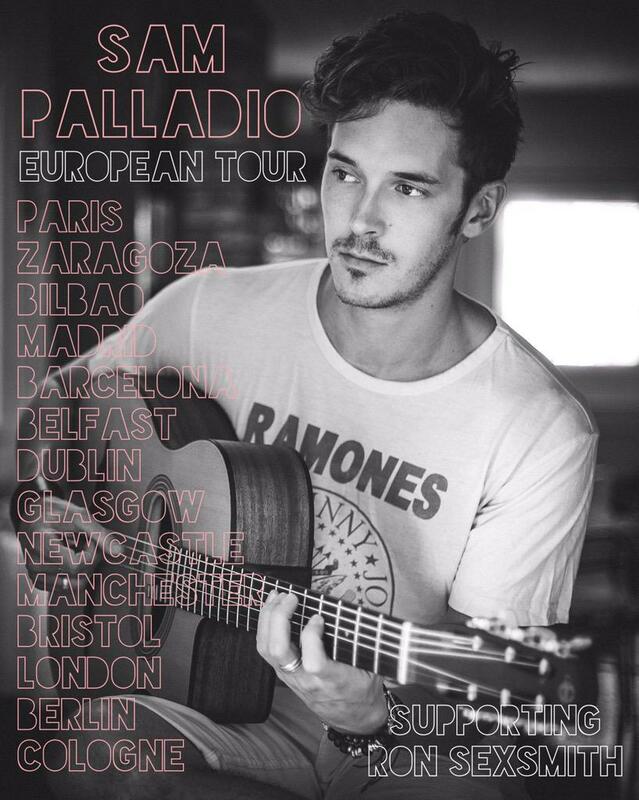 The British born Star of the ABC / Channel 4 musical drama Nashville, Sam Palladio completes the trio of singer songwriters assembled for Ron Sexsmith’s European tour, together with Ben Watt they'll be punching M13 9RD into the Sat Nav this coming Saturday June 27th en route to Manchester’s RNCM. I spoke to Sam this morning in Ireland. He’s feeling fresh after last night’s Belfast show, he tells me Ron’s theatre style shows bring a real sense of intimacy, and describes it as a completely different beast to the celebrity mayhem that surrounds him when he’s back in Tennessee. Sam and his Nashville co-stars are now big business in the US. Sam plays the part of a Texan called Gunnar Scott, a kind-hearted aspiring musician, he said the kind hearted and aspiring came naturally and twice weekly vocal classes at Uni helped him nail the accent. The trick is to strip the language down to phonetics, I’ve always been good at watching and imitating and living in the states I’m able to imitate my friends there. It gets to become second nature. I can do American, Irish all sorts even Mancunian. He said, tailing off in a belting Manc accent. It was the first TV audition I ever had, I thought I wouldn’t have a chance. You know - why would they cast an English guy from Cornwall to play a Texan? It may have been his first TV audition but as I’m finding out he wasn’t entirely unprepared for the role. He trained as an actor at Rose Bruford College in London and attended a 3 year actor/musician degree where you train as an actor and everyone there plays instruments, making music or scoring plays whilst training to be an actor sounds like good prep to me. At the beginning of 2012 Sam scored an American manager, she flew to London to meet him, they got on well and she agreed to represent him in the states. I didn’t have anyone to read the audition with me, I just had my web cam, they’d asked for a self-taped audition so I recorded the other characters lines on my I-phone leaving a gap for me to say the part I was trying out for. For me this seemed like the obvious way to do it. He sent the audition tape off after adding a couple of songs of his own and didn’t think anything more about it. 1 week later I got a phone call to say that ABC television network loved my audition and they asked if I would re tape it professionally, seems they didn’t appreciate my bedroom audition. Just a few days after sending the non-bedroom / professional tape he was packing his bags for the Capital city of Country Music. I certainly learnt a lot about modern country music and country artists that I hadn’t heard of that are super stars in the U.S. It was an education when I got there for sure. I’d always loved English folk and American folk, sounds of the 60’s and 70’s, James Taylor I love, Carlie Simon, Crosby Stills Nash and also the classics, Johnny Cash Elvis and so on. I’ve loved playing guitar and singing all my life, my dad played guitar, and the house was always littered with instruments. I find out that a series takes 9 months to film, and the cast are there the whole time with just a couple of weeks off for Christmas and a couple of months off in the summer, luckily this tour has fallen nicely into his summer break. No ties yet but it looks like Sam’s settling down in Tennessee, he’s now a permanent resident in Nashville. It has a great community spirit, and it attracts great song writers, I’m making great connections with some amazing local musicians. It feels like a small town to me rather than a big city. And as I’m from a small town originally - Penzance in Cornwall I’m used to seeing familiar and friendly faces every day. I’m so lucky to have another year on the show and another year of experimenting and growing as an artist. Sam is due to start filming Series 4 on the 16th of July, which guarantees him another year in the city. The show gives him a convenient barrier / buffer to work on his own music a little more, he’s in no rush to finish it quickly. I get the feeling he’s one catchy tune away from been a global star. He’s got the talent, he’s a handsome fella and he’s certainly amassing the connections, and not just in Country music circles. He told me a great story about when he had breakfast with Obama, he was delighted to be able to take his parents along. I took my parents to the states for the first time in 2012/2013 and during the trip I was invited with Claire Bowen (Nashville co-star) to sing in Washington at the Ford Theatre (where Lincoln was assassinated) at a show where they honor the Lincoln medal, impressive enough but as part of the event we had breakfast at the Whitehouse, you guessed it Barack was there. So the first time my parents went to America they went to the White House and met the president. There’s no doubt, showing ones parents how well we are doing is one of life’s most gratifying feelings. Interestingly it was Sam’s mum that first introduced him to Canadian legend Ron Sexsmith, not physically but his music at least. He tells me his Mum was very unwell for a time - she discovered his music and for her it was calming and healing, she listened to him constantly and that meant Sam would hear a lot of it, he too became seduced by the melancholy vibe. Ron was in Nashville a couple of months ago, a mutual friend took me to his sound check and introduced us, I met his management and all the team and naturally I told them the story, essentially, thank you for your music, it helped my mum and my family and I will always be grateful. Finally I got a bit cheeky and said to him manager Malcolm Dixon “Listen if Ron ever needs an opening act, I’d love to play some shows with him” As luck would have it he had this amazing European tour and they offered me the gig. Getting to travel to new places and meet new fans of the show in the UK and Ireland is great, I’m amazed at how popular the show is over here. It’s great to connect with people on a more personal level. Sam Palladio (Gunnar) and Clare Bowen (Scarlett) perform a Season 1 favorite "Fade Into You". No stranger to the city of Manchester, Sam was in cast of a jukebox musical Dreamboats and Petticoats at The Opera House, maybe 6 or so years ago, although he’s never played music in Manchester. I’m so pleased to be back as effectively my own person, last time I was touring with a big theatre show, it was great, very Rock N Roll, this time around I get to show people a different side of me that they won’t have seen on stage or on screen. Sam joins the already announced special guest artist Ben Watt (Everything But The Girl) in opening the show for Sexsmith. If you like your music melancholic or with a country style then this talented trio of singer songwriters should see your Saturday night taken care of nicely.